Forkhead box protein O1 (FOXO1) also known as forkhead in rhabdomyosarcoma is a protein that in humans is encoded by the FOXO1 gene. FOXO1 is a transcription factor that plays important roles in regulation of gluconeogenesis and glycogenolysis by insulin signaling, and is also central to the decision for a preadipocyte to commit to adipogenesis. It is primarily regulated through phosphorylation on multiple residues; its transcriptional activity is dependent on its phosphorylation state. In its un-phosphorylated state, FOXO1 is localized to the nucleus, where it binds to the insulin response sequence located in the promoter for glucose 6-phosphatase and increases its rate of transcription. FOXO1, through increasing transcription of glucose-6-phosphatase, indirectly increases the rate of hepatic glucose production. However, when FOXO1 is phosphorylated by Akt on Thr-24, Ser-256, and Ser-319, it is excluded from the nucleus, where it is then ubiquitinated and degraded. The phosphorylation of FOXO1 by Akt subsequently decreases the hepatic glucose production through a decrease in transcription of glucose 6-phosphatase. Recent research has demonstrated that FOXO1 also negatively regulates adipogenesis. Presently, the exact mechanism by which this is accomplished is not entirely understood. In the currently accepted model, FOXO1 negatively regulates adipogenesis by binding to the promoter sites of PPARG and preventing its transcription. Rising levels of PPARG are required to initiate adipogenesis; by preventing its transcription, FOXO1 is preventing the onset of adipogenesis. During stimulation by insulin, FOXO1 is excluded from the nucleus and is subsequently unable to prevent transcription of PPARG and inhibit adipogenesis. However, there is substantial evidence to suggest that there are other factors that mediate the interaction between FOXO1 and the PPARG promoter, and that inhibition of adipogenesis is not entirely dependent on FOXO1 preventing transcription of PPARG. Other research demonstrates that the failure to commit to adipogenesis is primarily due to active FOXO1 arresting the cell in G0/G1 through activation of yet unknown downstream targets, with a putative target being SOD2. FOXO1 belongs to the forkhead family of transcription factors that are characterized by a distinct fork head domain. The specific function of this gene has not yet been determined; however, it may play a role in myogenic growth and differentiation. FOXO1 is essential for the maintenance of human ESC pluripotency. This function is probably mediated through direct control by FOXO1 of OCT4 and SOX2 gene expression through occupation and activation of their respective promoters. In hepatic cells this transcription factor seems to increase the expression of PEPCK and glycogen-6-phosphatase (the same enzymes that are blocked via the metformin/AMPK/SHP pathway). Blocking this transcription factor offers an opportunity for novel therapies for diabetes mellitus. In pancreatic alpha-cells FOXO1 is important in regulating prepro-glucagon expression. In pancreatic beta cells FOXO1 mediates glucagon-like peptide-1 effects on pancreatic beta-cell mass. When the level of blood glucose is high, the pancreas releases insulin into the bloodstream. 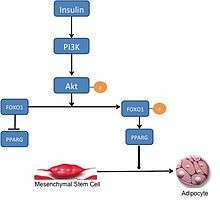 Insulin then causes the activation of PI3K, which subsequently phosphorylates Akt. Akt then phosphorylates FOXO1, causing nuclear exclusion. This phosphorylated FOXO1 is then ubiquitinated and degraded by the proteosome. The phosphorylation of FOXO1 is irreversible; this prolongs insulin's inhibitory effect on glucose metabolism and hepatic glucose production. Transcription of glucose 6-phosphatase subsequently decreases, which consequently decreases the rates of gluconeogenesis and glycogenolysis. Certain research groups have also recently suggested that FOXO1 also activates transcription of phosphoenolpyruvate carboxykinase, which is required for gluconeogenesis. Recent research has demonstrated that the activity of FOXO1 is also regulated through CBP induced acetylation on Lys-242, Lys-245, and Lys-262. These lysine residues are located within the DNA-binding domain; acetylation inhibits the ability of FOXO1 to interact with the glucose-6 phosphatase promoter by decreasing the stability of the FOXO1-DNA complex. Additionally, this acetylation increases the rate of phosphorylation on Ser-253 by Akt. Interestingly, mutating Ser-253 to Ala-253 makes FOXO1 constitutionally active. Further research has demonstrated that SIRT1 reverses this acetylation process; however, the exact mechanism by which SIRT1 deacetylates FOXO1 is still under investigation; presently, acetylation is thought to mitigate the transcriptional activity of FOXO1 and thereby provide an additional level of metabolic regulation that is independent of the insulin/PI3K pathway. Because FOXO1 provides a link between transcription and metabolic control by insulin, it is also a potential target for genetic control of type 2 diabetes. In the insulin-resistant murine model, there is increased hepatic glucose production due to a loss in insulin sensitivity; the rates of hepatic gluconeogenesis and glycogenolysis are increased when compared to normal mice; this is presumably due to un-regulated FOXO1. When the same experiment was repeated with haploinsufficient FOXO1, insulin sensitivity was partially restored, and hepatic glucose production subsequently decreased. Similarly, in mice fed with a high fat diet (HFD), there is increased insulin resistance in skeletal and liver cells. However, when haploinsufficient FOXO1 mice were treated with the same HFD, there was a notable decrease in insulin resistance in both skeletal and liver cells. This effect was significantly augmented by the simultaneous administration of rosiglitazone, which is a commonly prescribed anti-diabetic drug. These results create an opportunity for a novel gene therapy based approach to alleviating insulin desensitization in type 2 diabetes. Current research is investigating the potential of combining FOXO1 and Notch-1 haploinsufficiency in mice; preliminary results suggest that in HFD-fed mice, the combination of FOXO1 and Notch-1 haploinsufficiency was more effective at restoring insulin sensitivity than FOXO1 haploinsufficiency alone. Translocation of this gene with PAX3 has been associated with alveolar rhabdomyosarcoma. 1 2 Galili N, Davis RJ, Fredericks WJ, Mukhopadhyay S, Rauscher FJ, Emanuel BS, Rovera G, Barr FG (November 1993). "Fusion of a fork head domain gene to PAX3 in the solid tumour alveolar rhabdomyosarcoma". Nat. Genet. 5 (3): 230–5. doi:10.1038/ng1193-230. PMID 8275086. ↑ Nakae J, Kitamura T, Kitamura Y, Biggs WH, Arden KC, Accili D (January 2003). "The forkhead transcription factor Foxo1 regulates adipocyte differentiation". Dev. Cell. 4 (1): 119–29. doi:10.1016/S1534-5807(02)00401-X. PMID 12530968. ↑ Rena G, Guo S, Cichy SC, Unterman TG, Cohen P (June 1999). "Phosphorylation of the transcription factor forkhead family member FKHR by protein kinase B". J. Biol. Chem. 274 (24): 17179–83. doi:10.1074/jbc.274.24.17179. PMID 10358075. 1 2 Nakae J, Kitamura T, Silver DL, Accili D (November 2001). "The forkhead transcription factor Foxo1 (Fkhr) confers insulin sensitivity onto glucose-6-phosphatase expression". J. Clin. Invest. 108 (9): 1359–67. doi:10.1172/JCI12876. PMC 209440 . PMID 11696581. ↑ Farmer SR (January 2003). "The forkhead transcription factor Foxo1: a possible link between obesity and insulin resistance". Mol. Cell. 11 (1): 6–8. doi:10.1016/S1097-2765(03)00003-0. PMID 12535515. ↑ Armoni M, Harel C, Karni S, Chen H, Bar-Yoseph F, Ver MR, Quon MJ, Karnieli E (July 2006). "FOXO1 represses peroxisome proliferator-activated receptor-gamma1 and -gamma2 gene promoters in primary adipocytes. 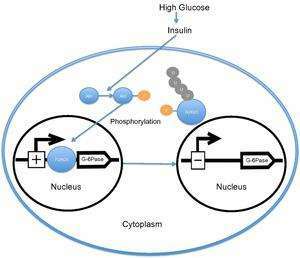 A novel paradigm to increase insulin sensitivity". J. Biol. Chem. 281 (29): 19881–91. doi:10.1074/jbc.M600320200. PMID 16670091. ↑ Puigserver P, Rhee J, Donovan J, Walkey CJ, Yoon JC, Oriente F, Kitamura Y, Altomonte J, Dong H, Accili D, Spiegelman BM (May 2003). "Insulin-regulated hepatic gluconeogenesis through FOXO1-PGC-1alpha interaction". Nature. 423 (6939): 550–5. doi:10.1038/nature01667. PMID 12754525. ↑ Adachi M, Osawa Y, Uchinami H, Kitamura T, Accili D, Brenner DA (April 2007). "The forkhead transcription factor FoxO1 regulates proliferation and transdifferentiation of hepatic stellate cells". Gastroenterology. 132 (4): 1434–46. doi:10.1053/j.gastro.2007.01.033. PMID 17408630. ↑ "Entrez Gene: FOXO1 forkhead box O1 (rhabdomyosarcoma)". ↑ Zhang X, Yalcin S, Lee DF, Yeh TY, Lee SM, Su J, Mungamuri SK, Rimmelé P, Kennedy M, Sellers R, Landthaler M, Tuschl T, Chi NW, Lemischka I, Keller G, Ghaffari S (September 2011). "FOXO1 is an essential regulator of pluripotency in human embryonic stem cells". Nat. Cell Biol. 13 (9): 1092–9. doi:10.1038/ncb2293. PMC 4053529 . PMID 21804543. ↑ Nagashima T, Shigematsu N, Maruki R, Urano Y, Tanaka H, Shimaya A, Shimokawa T, Shibasaki M (August 2010). "Discovery of novel forkhead box O1 inhibitors for treating type 2 diabetes: improvement of fasting glycemia in diabetic db/db mice". Mol. Pharmacol. 78 (5): 961–70. doi:10.1124/mol.110.065714. PMID 20736318. ↑ McKinnon CM, Ravier MA, Rutter GA (December 2006). "FoxO1 is required for the regulation of preproglucagon gene expression by insulin in pancreatic alphaTC1-9 cells". J. Biol. Chem. 281 (51): 39358–69. doi:10.1074/jbc.M605022200. PMID 17062568. ↑ Buteau J, Spatz ML, Accili D (May 2006). "Transcription factor FoxO1 mediates glucagon-like peptide-1 effects on pancreatic beta-cell mass". Diabetes. 55 (5): 1190–6. doi:10.2337/db05-0825. PMID 16644672. ↑ Matsuzaki H, Daitoku H, Hatta M, Tanaka K, Fukamizu A (September 2003). "Insulin-induced phosphorylation of FKHR (Foxo1) targets to proteasomal degradation". Proc. Natl. Acad. Sci. U.S.A. 100 (20): 11285–90. doi:10.1073/pnas.1934283100. PMC 208749 . PMID 13679577. ↑ Daitoku H, Fukamizu A (June 2007). "FOXO transcription factors in the regulatory networks of longevity". J. Biochem. 141 (6): 769–74. doi:10.1093/jb/mvm104. PMID 17569704. ↑ Matsuzaki H, Daitoku H, Hatta M, Aoyama H, Yoshimochi K, Fukamizu A (August 2005). "Acetylation of Foxo1 alters its DNA-binding ability and sensitivity to phosphorylation". Proc. Natl. Acad. Sci. U.S.A. 102 (32): 11278–83. doi:10.1073/pnas.0502738102. PMC 1183558 . PMID 16076959. ↑ Jing E, Gesta S, Kahn CR (August 2007). "SIRT2 regulates adipocyte differentiation through FoxO1 acetylation/deacetylation". Cell Metab. 6 (2): 105–14. doi:10.1016/j.cmet.2007.07.003. PMC 2083635 . PMID 17681146. ↑ Nakae J, Biggs WH, Kitamura T, Cavenee WK, Wright CV, Arden KC, Accili D (October 2002). "Regulation of insulin action and pancreatic beta-cell function by mutated alleles of the gene encoding forkhead transcription factor Foxo1". Nat. Genet. 32 (2): 245–53. doi:10.1038/ng890. PMID 12219087. ↑ Kim JJ, Li P, Huntley J, Chang JP, Arden KC, Olefsky JM (June 2009). "FoxO1 haploinsufficiency protects against high-fat diet-induced insulin resistance with enhanced peroxisome proliferator-activated receptor gamma activation in adipose tissue". Diabetes. 58 (6): 1275–82. doi:10.2337/db08-1001. PMC 2682681 . PMID 19289458. ↑ Pajvani UB, Shawber CJ, Samuel VT, Birkenfeld AL, Shulman GI, Kitajewski J, Accili D (August 2011). "Inhibition of Notch signaling ameliorates insulin resistance in a FoxO1-dependent manner". Nat. Med. 17 (8): 961–7. doi:10.1038/nm.2378. PMC 3387563 . PMID 21804540. ↑ Linardic CM (October 2008). "PAX3-FOXO1 fusion gene in rhabdomyosarcoma". Cancer Lett. 270 (1): 10–8. doi:10.1016/j.canlet.2008.03.035. PMC 2575376 . PMID 18457914. ↑ Li P, Lee H, Guo S, Unterman TG, Jenster G, Bai W (January 2003). "AKT-independent protection of prostate cancer cells from apoptosis mediated through complex formation between the androgen receptor and FKHR". Mol. Cell. Biol. 23 (1): 104–18. doi:10.1128/MCB.23.1.104-118.2003. PMC 140652 . PMID 12482965. ↑ Schuur ER, Loktev AV, Sharma M, Sun Z, Roth RA, Weigel RJ (September 2001). "Ligand-dependent interaction of estrogen receptor-alpha with members of the forkhead transcription factor family". J. Biol. Chem. 276 (36): 33554–60. doi:10.1074/jbc.M105555200. PMID 11435445. ↑ Nasrin N, Ogg S, Cahill CM, Biggs W, Nui S, Dore J, Calvo D, Shi Y, Ruvkun G, Alexander-Bridges MC (September 2000). "DAF-16 recruits the CREB-binding protein coactivator complex to the insulin-like growth factor binding protein 1 promoter in HepG2 cells". Proc. Natl. Acad. Sci. U.S.A. 97 (19): 10412–7. doi:10.1073/pnas.190326997. PMC 27038 . PMID 10973497. ↑ Cao Y, Kamioka Y, Yokoi N, Kobayashi T, Hino O, Onodera M, Mochizuki N, Nakae J (December 2006). "Interaction of FoxO1 and TSC2 induces insulin resistance through activation of the mammalian target of rapamycin/p70 S6K pathway". J. Biol. Chem. 281 (52): 40242–51. doi:10.1074/jbc.M608116200. PMID 17077083. Sublett JE, Jeon IS, Shapiro DN (1995). "The alveolar rhabdomyosarcoma PAX3/FKHR fusion protein is a transcriptional activator". Oncogene. 11 (3): 545–52. PMID 7630639. Fredericks WJ, Galili N, Mukhopadhyay S, Rovera G, Bennicelli J, Barr FG, Rauscher FJ (1995). "The PAX3-FKHR fusion protein created by the t(2;13) translocation in alveolar rhabdomyosarcomas is a more potent transcriptional activator than PAX3". Mol. Cell. Biol. 15 (3): 1522–35. PMC 230376 . PMID 7862145. Galili N, Davis RJ, Fredericks WJ, Mukhopadhyay S, Rauscher FJ, Emanuel BS, Rovera G, Barr FG (1993). "Fusion of a fork head domain gene to PAX3 in the solid tumour alveolar rhabdomyosarcoma". Nat. Genet. 5 (3): 230–5. doi:10.1038/ng1193-230. PMID 8275086. Scheidler S, Fredericks WJ, Rauscher FJ, Barr FG, Vogt PK (1996). "The hybrid PAX3-FKHR fusion protein of alveolar rhabdomyosarcoma transforms fibroblasts in culture". Proc. Natl. Acad. Sci. U.S.A. 93 (18): 9805–9. doi:10.1073/pnas.93.18.9805. PMC 38510 . PMID 8790412. Anderson MJ, Viars CS, Czekay S, Cavenee WK, Arden KC (1998). "Cloning and characterization of three human forkhead genes that comprise an FKHR-like gene subfamily". Genomics. 47 (2): 187–99. doi:10.1006/geno.1997.5122. PMID 9479491. Tang ED, Nuñez G, Barr FG, Guan KL (1999). "Negative regulation of the forkhead transcription factor FKHR by Akt". J. Biol. Chem. 274 (24): 16741–6. doi:10.1074/jbc.274.24.16741. PMID 10358014. Rena G, Guo S, Cichy SC, Unterman TG, Cohen P (1999). "Phosphorylation of the transcription factor forkhead family member FKHR by protein kinase B". J. Biol. Chem. 274 (24): 17179–83. doi:10.1074/jbc.274.24.17179. PMID 10358075. Medema RH, Kops GJ, Bos JL, Burgering BM (2000). "AFX-like Forkhead transcription factors mediate cell-cycle regulation by Ras and PKB through p27kip1". Nature. 404 (6779): 782–7. doi:10.1038/35008115. PMID 10783894. Margue CM, Bernasconi M, Barr FG, Schäfer BW (2000). "Transcriptional modulation of the anti-apoptotic protein BCL-XL by the paired box transcription factors PAX3 and PAX3/FKHR". Oncogene. 19 (25): 2921–9. doi:10.1038/sj.onc.1203607. PMID 10871843. Nasrin N, Ogg S, Cahill CM, Biggs W, Nui S, Dore J, Calvo D, Shi Y, Ruvkun G, Alexander-Bridges MC (2000). "DAF-16 recruits the CREB-binding protein coactivator complex to the insulin-like growth factor binding protein 1 promoter in HepG2 cells". Proc. Natl. Acad. Sci. U.S.A. 97 (19): 10412–7. doi:10.1073/pnas.190326997. PMC 27038 . PMID 10973497. Jackson JG, Kreisberg JI, Koterba AP, Yee D, Brattain MG (2000). "Phosphorylation and nuclear exclusion of the forkhead transcription factor FKHR after epidermal growth factor treatment in human breast cancer cells". Oncogene. 19 (40): 4574–81. doi:10.1038/sj.onc.1203825. PMID 11030146. Rena G, Prescott AR, Guo S, Cohen P, Unterman TG (2001). "Roles of the forkhead in rhabdomyosarcoma (FKHR) phosphorylation sites in regulating 14-3-3 binding, transactivation and nuclear targetting". Biochem. J. 354 (Pt 3): 605–12. doi:10.1042/0264-6021:3540605. PMC 1221692 . PMID 11237865. Woods YL, Rena G, Morrice N, Barthel A, Becker W, Guo S, Unterman TG, Cohen P (2001). "The kinase DYRK1A phosphorylates the transcription factor FKHR at Ser329 in vitro, a novel in vivo phosphorylation site". Biochem. J. 355 (Pt 3): 597–607. PMC 1221773 . PMID 11311120. Zhao HH, Herrera RE, Coronado-Heinsohn E, Yang MC, Ludes-Meyers JH, Seybold-Tilson KJ, Nawaz Z, Yee D, Barr FG, Diab SG, Brown PH, Fuqua SA, Osborne CK (2001). "Forkhead homologue in rhabdomyosarcoma functions as a bifunctional nuclear receptor-interacting protein with both coactivator and corepressor functions". J. Biol. Chem. 276 (30): 27907–12. doi:10.1074/jbc.M104278200. PMID 11353774. Schuur ER, Loktev AV, Sharma M, Sun Z, Roth RA, Weigel RJ (2001). "Ligand-dependent interaction of estrogen receptor-alpha with members of the forkhead transcription factor family". J. Biol. Chem. 276 (36): 33554–60. doi:10.1074/jbc.M105555200. PMID 11435445. Patel S, Lochhead PA, Rena G, Sutherland C (2001). "Antagonistic effects of phorbol esters on insulin regulation of insulin-like growth factor-binding protein-1 (IGFBP-1) but not glucose-6-phosphatase gene expression". Biochem. J. 359 (Pt 3): 611–9. doi:10.1042/0264-6021:3590611. PMC 1222183 . PMID 11672436. Ayalon D, Glaser T, Werner H (2001). "Transcriptional regulation of IGF-I receptor gene expression by the PAX3-FKHR oncoprotein". Growth Horm. IGF Res. 11 (5): 289–97. doi:10.1054/ghir.2001.0244. PMID 11735247. Christian M, Zhang X, Schneider-Merck T, Unterman TG, Gellersen B, White JO, Brosens JJ (2002). "Cyclic AMP-induced forkhead transcription factor, FKHR, cooperates with CCAAT/enhancer-binding protein beta in differentiating human endometrial stromal cells". J. Biol. Chem. 277 (23): 20825–32. doi:10.1074/jbc.M201018200. PMID 11893744. Rena G, Woods YL, Prescott AR, Peggie M, Unterman TG, Williams MR, Cohen P (2002). "Two novel phosphorylation sites on FKHR that are critical for its nuclear exclusion". EMBO J. 21 (9): 2263–71. doi:10.1093/emboj/21.9.2263. PMC 125977 . PMID 11980723. Sorensen PH, Lynch JC, Qualman SJ, Tirabosco R, Lim JF, Maurer HM, Bridge JA, Crist WM, Triche TJ, Barr FG (2002). "PAX3-FKHR and PAX7-FKHR gene fusions are prognostic indicators in alveolar rhabdomyosarcoma: a report from the children's oncology group". J. Clin. Oncol. 20 (11): 2672–9. doi:10.1200/JCO.2002.03.137. PMID 12039929. Nakae J, Oki M, Cao Y (2008-01-09). "The FoxO transcription factors and metabolic regulation". FEBS Lett. 582 (1): 54–67. doi:10.1016/j.febslet.2007.11.025. PMID 18022395.